Creative Nails wishes you a Very Happy Valentine’s Day! This day was first associated with romantic love in the circle of Geoffrey Chaucer in the High Middle Ages, when the tradition of courtly love flourished. In 18th-century England, it evolved into an occasion in which lovers expressed their love for each other by presenting flowers, offering confectionery, and sending greeting cards (known as “valentines“). In Europe, Saint Valentine’s Keys are given to lovers “as a romantic symbol and an invitation to unlock the giver’s heart”, as well as to children, in order to ward off Saint Valentine’s Malady. Valentine’s Day symbols that are used today include the heart-shaped outline, doves, and the figure of the winged Cupid. Since the 19th century, handwritten valentines have given way to mass-produced greeting cards. Guys, gift your valentine with the Hearty Chain created by Creative Nails. 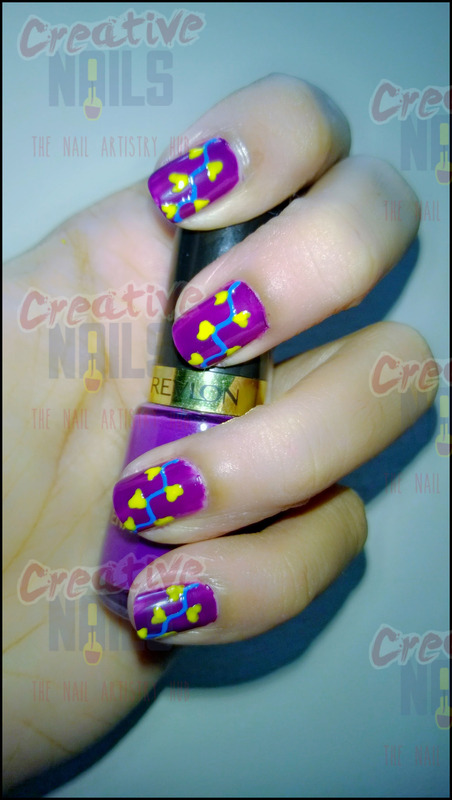 And Gals, impress your valentine with this special manicure created with Revlon’s Royal Purple Nail Enamel!! Once again Happy Valentine’s Day! ← Valentine Heart Nail Design!